David Diamond was born in Rochester, NY, and studied at the Cleveland Institute of Music and the Eastman School of Music, as well as with Nadia Boulanger in Paris. 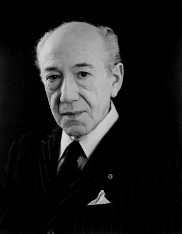 He won a number of awards including three Guggenheim Fellowships, and is considered one of the preeminent American composers of his generation. Among Diamond's works are eleven symphonies, concertos including three for violin, eleven string quartets, music for wind ensemble, other chamber music, piano pieces, and vocal music. He composed the musical theme heard on the CBS Radio Network broadcast "Hear It Now" (1950–51) and its TV successor, "See It Now" (1951–58). Diamond was named honorary composer-in-residence of the Seattle Symphony. He was a longtime member of the Juilliard School faculty. In 1995, he was awarded the National Medal of Arts.